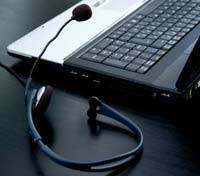 VoIP is a way of using the internet to make cheap long distance and international telephone calls. Using a VoIP internet phone service is a great way to save money on international calls worldwide. This is a quick introduction to VoIP that describes how you can use this exciting technology to save money on your long distance and international phone calls. If you are interested in buying a VoIP service plan, click here for a list of our recommended VoIP providers. There are 3 basic kinds of VoIP calls. Depending on your needs, you may make VoIP calls using some or all of these approaches. For a fee, many VoIP providers can assign you an in-country local phone number. Using that number, your friends and colleagues can call you as if you were around the corner. Although there are many variants, you can buy 4 main types of VoIP services. Check here for more details on how to dial calls using a VoIP service. With this type of VoIP service, also known as a 'soft phone', you go online and initiate a call by entering the originating and destination telephone numbers. The VoIP provider then automatically dials each party separately and each phone rings at the same time. When you each answer, the call is completed. Like calling card VoIP, this approach uses VoIP for the 'long haul' part of the call and then the local phone networks at each end. To make some kinds of VoIP calls, you not only need a VoIP service provider, but you also need some VoIP phone gear as well. What you need depends on the kind of VoIP service you have - see the above section on Types of VoIP Service and the page How to Make Calls Using VoIP for details on the 4 types of VoIP service providers. Note: not all VoIP services require require special equipment. VoIP phone adapters are used to connect your regular telephone to your broadband internet connection. You can also connect to a T1 line, if the T1 line cost is feasible, to provide faster connectivity. These devices attach in one direction to your regular telephone with a normal phone line and in the other direction to your internet modem or router. Once connected, you can make and receive VoIP calls using your regular phone.